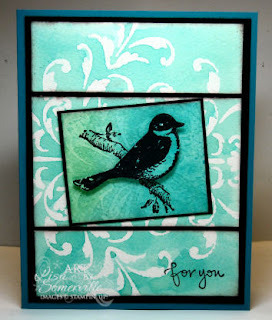 I had started this card out, morphing the Wet Stencil Technique from the TJNL, using ink instead of WC Crayons....But somewhere my morphed technique took a turn....For those familiar with the Wet Stencil, I know you're probably thinking nope, looks like Wet Stencil to me...Well, I guess I should tell you the panel the bird image is stamped on was a piece of Wet Stencil...the piece that went awry. The panel under my image is done correctly at Wet Stencil - except morphed as I mentioned. I'm still happy with the image under the bird, the color isn't as watered down as my actual West Stencil piece. I did try to duplicate the darker color a number of times, but alas no luck! I am new to TJ so I don't know what the "wet stencil" technique is, but I sure can appreciate the effects- this card is GORGEOUS!